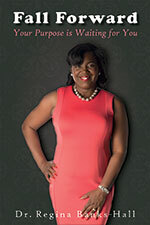 Regina Banks-Hall, Business Strategist, International Author, Entrepreneur, Adjunct Professor, Personal and Professional Mentor is a gifted speaker and motivator, inspiring individuals of all ages to fulfill their destiny using their God-given talent. Regina possesses a keen business acumen, developing strategies to improve business operations, employee training and development, and overall organization efficiency, working for retail, automotive and local government industries. Regina is the owner of Regina‚s All Star Apparel and Accessories, a promotional product corporation, and adjunct faculty member for Concordia University. Regina works as a volunteer financial coach for her local church, meeting one on one with individuals and couples to help them with personal financial budgeting. In addition, Regina has recently launched a professional development organization, RBH Professional Development Institute, which offers training, coaching, motivational and inspirational material for women and teens. Regina earned her BA in Business Management and a MBA in Human Resource Management both from Baker College in Flint, Michigan Regina is currently enrolled in a DBA Program at Walden University, specializing in Organizational Leadership. Professional Woman Network (PWN) serving as a Board Member for 2014-2016, Society of Human Resources Management(SHRM), American Society of Training and Development (ASTD), National Association of Professional Women (NAPW), American Management Association (AMA), the Black MBA Association (BMBAA) and serving as the 2014-2015 VP of Public Relations for Tech Talk Toastmasters Detroit. Regina believes her purpose is to inspire women and teens to overcome their fear and walk into their destiny.